Gr 4 Up –Having gained the trust and acceptance of a mother cheetah, conservationist and cameraman Kim Wolhuter takes viewers on an 18-month journey into the life of the cheetah and her five cubs. As viewers watch the cubs grow—from hiding while the mother hunts, to learning to scan, stalk, chase, kill and eat prey—they witness the cubs’ trepidation as they gain new skills and are exposed to other African wildlife including elephants, zebras, and giraffes. Only two of the cubs survive at the end of Wolhuter’s study. Two are killed by predators, not shown, and one dies of an illness—there is some blood but no gore; younger viewers should not be unduly upset. Wolhuter intervenes when one of the cubs is seriously injured by a predator and explains that such intervention is permitted in cases of injuries caused by humans or when the animal is an endangered species; cheetahs are the most threatened big cat in Africa. The filming is beautifully filmed, and the details about these animals’ lives are fascinating. 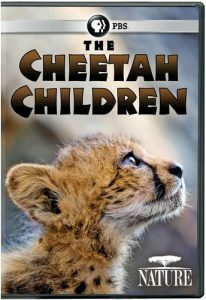 A year after the study concludes, and while Wolhuter is working on another project, he encounters a cheetah and realizes it is one of the cubs. After a bit of time watching Wolhuter, the cub eventually comes to him and licks his face. Unfortunately, this encounter is not on film, but Wolhuter’s description of it is very moving and provides a moving finale. ­VERDICT This film would be of interest to animal lovers, biology classes, environmental studies, and videography classes.–Cynthia Ortiz, Hackensack High School, NJ This review was published in the School Library Journal May 2018 issue.